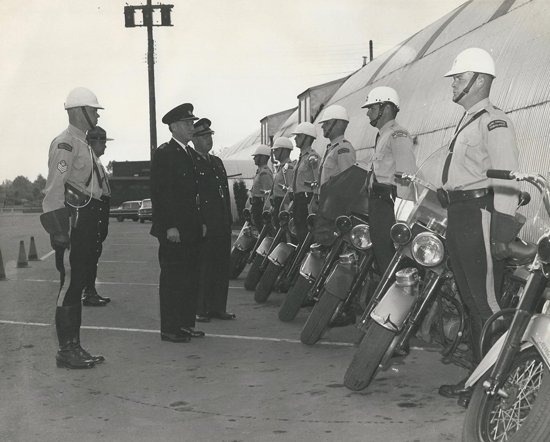 Ric Hall received from Marv Ukraineitz an old 1963 photograph of the RCMP motorcycle course held at the Cloverdale Fairgrounds in Surrey, B.C. According to Marv “RCMP Cpl. Bill Hulgaard and Cpl. William Todd were the instructors. There were motorcycles Cloverdale, and Burnaby. The training was required to be posted to the Pattullo Bridge Det.” His photograph is below with details of individuals in the photograph. 1963 – Cloverdale Fairgrounds in Surrey, BC:1963 motorcycle Course. Supt Woods – Johnson and Chief MACKIE New West PD inspecting, with Sgt Mert ROWDEN i/c Traffic, S/Sgt Wm MORRISON i/c Cloverdale Det. In the picutre Csts Gord CAIRNY, Wik HUGGANS New West PD, myself, Wayne HANKY. Can’t see the other two and don’t have a list. Taken by the south wall of the Cloverdale Curling rink, just south of the Cloverdale Race Track. (Source of photo – Marv Ukraineitz). According to Mert Rowden and Bill Hulgaard, this Cloverdale motorcycle course was developed and modelled after the California Highway Patrol course. We have included below other course photographs taken at the Cloverdale Rodeo grounds in Surrey, B.C. 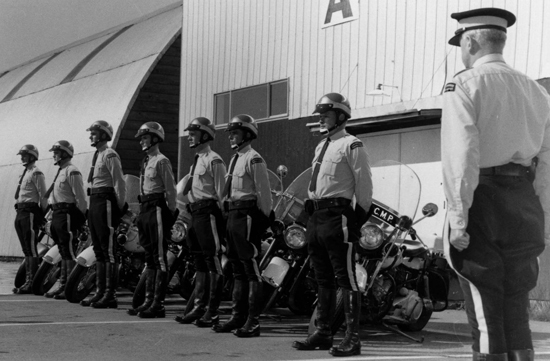 1950s Photograph of the RCMP Cloverdale motorcycle course participants (Source of photo – Ric Hall’s Photo Collection). 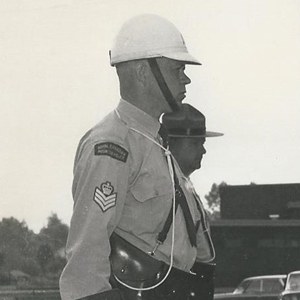 1960 Photograph of RCMP members attending the Cloverdale Motorcycle course (Source of photo – Ric Hall’s Photo Collection). 1968 – Photograph of the 1968’s #2 Motorcycle training course taken at the Cloverdale Rodeo grounds in Surrey B.C. (Source of photo – Ric Hall’s Photo Collection). 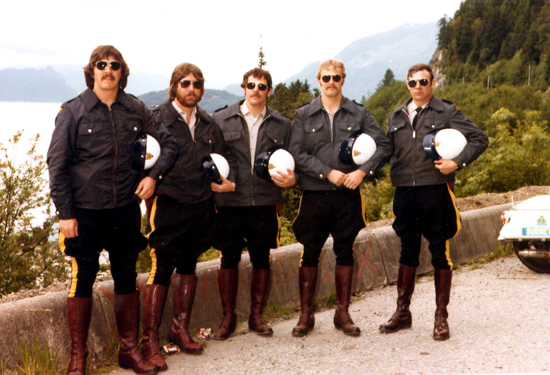 Mid 1970s Photograph of RCMP members trained in the proper use of a police motorcycle (Source of photo – Ric Hall’s Photo Collection). Once members completed their motorcycle course, they became an special group of traffic members who would regularly share their motorcycle experiences with police members in other police agencies. 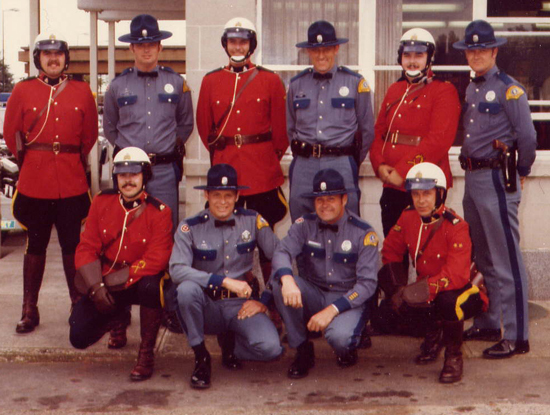 Late 1970s – Photograph of Surrey RCMP Traffic members photographed with members of the Washington State Patrol (Source of photo – Ric Hall’s Photo Collection). 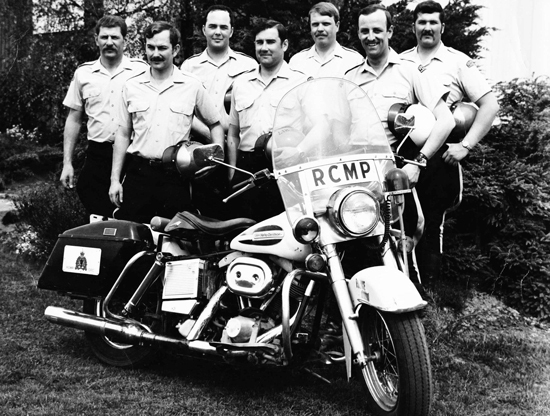 RCMP Traffic members were not the only members trained to operate a motorcycle. Other members who had a requirement to know about and operate a motorcycle on occasion were also provided this training. 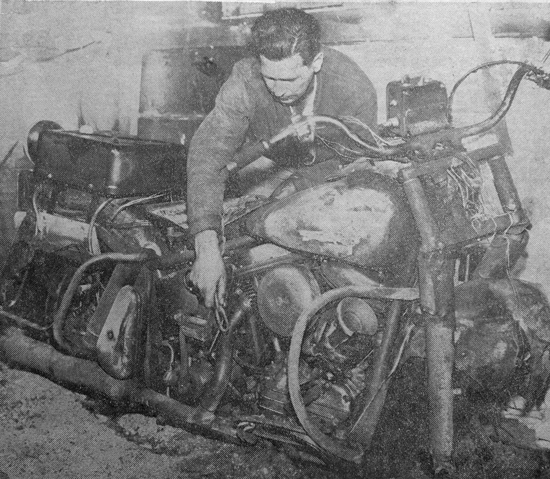 One of Surrey Detachment’s members was killed on a motorcycle on July 15, 1962 – Constable Archille Octave Maxime Lepine (Ret.#21512). It is his death that all RCMP members are reminded of how dangerous it is riding a motorcycle and why members must be appropriately trained to prepare them for critical situations. 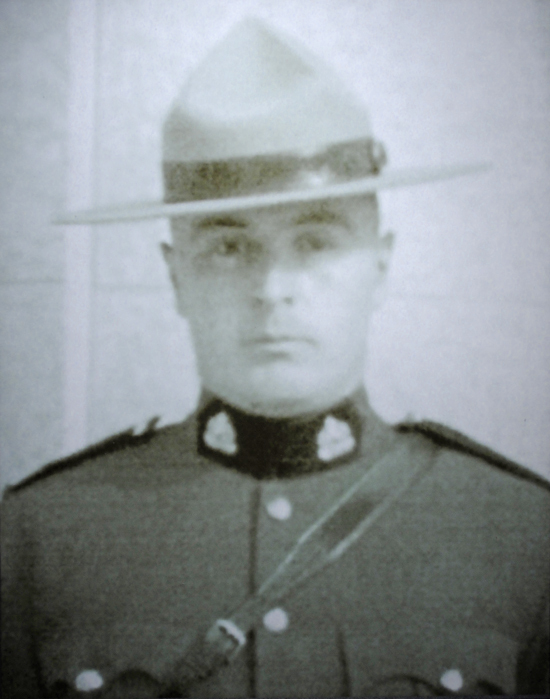 Photograph of RCMP Constable Archie Lepine (Source of photo – Surrey RCMP Detachment). Mangled Police Motorcycle was involved in a collision with a truck and burned early Sunday on Peterson Hill. Officer riding motorcycle at time, Const. Archie Lepine, 23, of Pttullo Bridge detachment, is in critical condition with fractured skull, broken arms and leg.